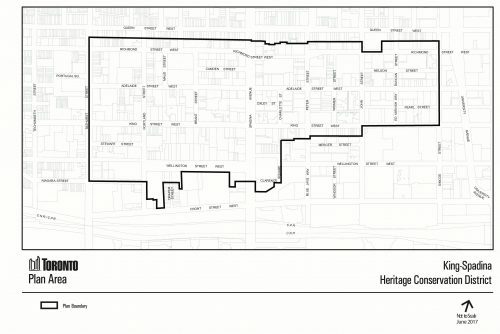 TAKE NOTICE that on October 4, 2017, Toronto City Council enacted By-law 1111-2017, which designated the King-Spadina Heritage Conservation District (area shown on attached map) under Part V of the Ontario Heritage Act. The by-law also adopted the King-Spadina Heritage Conservation District Plan, dated June 2017 as the district plan for the King-Spadina Heritage Conservation District. TAKE NOTICE that on November 9, 2017, Toronto City Council enacted By-law 1241-2017 To amend By-law 1111-2017 designating the King-Spadina Heritage Conservation District by removing certain properties incorrectly identified in Schedule B of By-law 1111-2017 as being part of the King-Spadina Heritage Conservation District. Additional information is included in the Explanatory Note on the following page. Alternatively, contact Heritage Preservation Services, by telephone at 416-338-1083 or by e-mail at tamara.anson-cartwright@toronto.ca. Dated at the City of Toronto this 16th day of April, 2018. On October 4, 2017, Toronto City Council adopted By-law No. 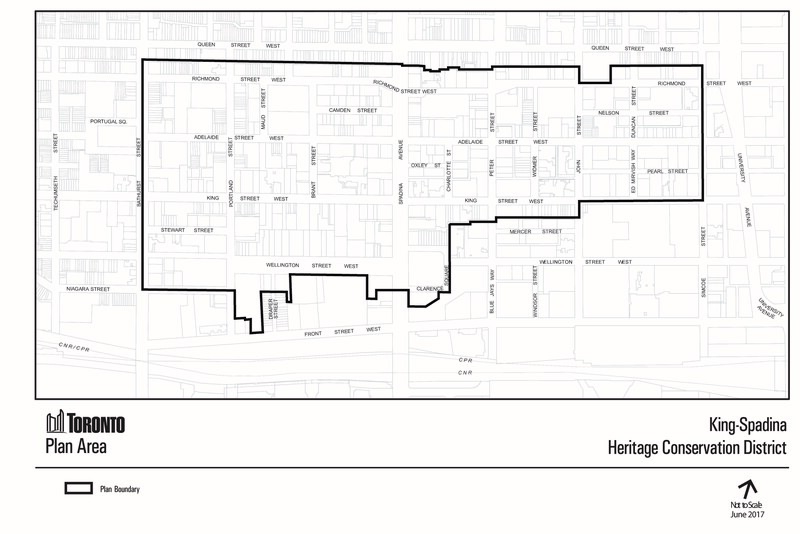 1111-2017, which designated the area shown on the map attached to this note as the King-Spadina Heritage Conservation District (the District) under Part V of the Ontario Heritage Act (the Act). The By-law also adopts the Heritage Conservation District Plan, dated June 2017. The purpose of By-law No. 1241-2017, is to remove certain properties that were incorrectly identified in Schedule B of By-law 1111-2017 as being part of the King-Spadina Heritage Conservation District.